Keshoyn Alexander, RB, Henderson, 7-carries for 90-yards, 2-TD’s, W/Van 21-20. Desmond Allen, RB, Pittsburg, 25-carries for 102-yards, W/Lorena 34-28. Darwin Barlow, RB, Newton, 7-carries for 144-yards, 3-TD’s, W/Troup 69-14. Gunner Capps, QB, Carthage, 24-36 passing for 405-yards, 5-TD’s, 1-carry for 11-yards, W/Midlothian Heritage 50-49 (OT). Jakobie Craver, RB, Daingerfield, 5-carries for 142-yards, 3-TD’s, W/Corrigan-Camden 62-0. Key Davis, RB, Oakwood, 11-carries for 167-yards, 3-TD’s, 3-catches for 85-yards, 3-TD’s, W/Richland Springs 66-56. Kelvontay Dixon, WR, Carthage, 11-catches for 140-yards, 4-carries for 14-yards, 1-2XP (Game-Winning Points), W/Midlothian Heritage 50-49 (OT). Tyler Fluellen, WR, Gilmer, 5-catches for 121-yards, 2-TD’s, L/Pleasant Grove 56-28. Andreas Garrett, RB, Malakoff, 176-yards of total offense, 2-TD’s, W/Gladewater 35-7. Bruce Garrett, RB, Pleasant Grove, 16-carries for 164-yards, 1-TD, 1-catch for 22-yards, W/Gilmer 56-28. J.J. Green, QB, Marshall, 14-33 passing for 289-yards, 5-TD’s, (5-Interceptions), L/Huntsville 35-34. Keithlen Griffin, WR, Pittsburg, 9-catches for 110-yards, 2-TD’s, W/Lorena 34-28. Ben Harmon, QB, Pleasant Grove, 12-14 passing for 266-yards, 5-TD’s (school record), 2-carries for 14-yards, W/Gilmer 56-28. 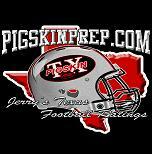 Jaylon Jimmerson, QB, Pittsburg, 20-carries for 122-yards, 3-TD’s, 17-23 passing for 204-yards, 2-TD’s, W/Lorena 34-28. Haynes King, QB, Longview, 13-16 passing for 248-yards, 3-TD’s, 16-carries for 93-yards, 2-TD’s, W/Austin Vandegrift 56-28. Jawan King, RB, Atlanta, 12-carries for 100-yards, 3-TD’s, W/Mount Vernon 38-14. Jay Lloyd, RB, Tenaha, 32-carries for 220-yards, 4-TD’s, W/Carlisle 35-14. Kamden Perry, WR, Longview, 8-catches for 139-yards, 1-TD, W/Austin Vandergrift 56-28. Andrew Samples, QB, Atlanta, 9-16 passing for 127-yards, 1-TD, 6-carries for 31-yards, 2-TD’s, W/Mount Vernon 38-14. DeMarcus Williams, WR, Marshall, 3-catches for 142-yards, 2-TD’s, L/Huntsville 35-34. Keilyn Williams, RB, Longview, 17-carries for 135-yards, 1-TD, 2-catches for 29-yards, 1-TD, W/Austin Vandegrift 56-28. Devlen Woods, QB, John Tyler, 12-21 passing for 137-yards, 2-TD’s, 12-carries for 62-yards, W/Frisco Lone Star 31-13. Jakauri Woods, QB, Daingerfield, 2-TD passes, 2-TD’s Rushing, W/Corrigan-Camden 62-0. De’Aundrey Bowman, Carthage, 45-yard Interception for TD, W/Midlothian Heritage 50-49 (OT). Key Davis, Oakwood, 15-Tackles, W/Richland Springs 66-56. Chandler Fontenot, DT, Pittsburg, 6-Tackles, 2-FR, W/Lorena 34-28. Pedro Garza, CB, Henderson, 2-Interceptions, 1-TD (86), W/Van 21-20. Tyrese Grant, Daingerfield, 80-yard FR for TD, W/Corrigan-Camden 62-0. Jordan Marshall, CB, Tenaha, 3-Interceptions, 4-Tackles, W/Carlisle 35-14. Michael Martin, Longview, 10-Tackles, 1-CF, 1-FR, W/Vandegrift 56-28. Jadrain McGraw, LB, Newton, 23-Tackles, 4-TFL, W/Troup 69-14. Jacob Nash, DT, Atlanta, 7-Tackles, 2-QBP, 2-CF, W/Mount Vernon 38-14. Bladen Reaves, ILB, Pleasant Grove, 9-Tackles, 1-QBP, W/Gilmer 56-28. Trevanta Royal, Daingerfield, 11-Tackles, 3-TFL, 1-Interception, 30-yard FR for TD, W/Corrigan-Camden 62-0. Colby Rush, LB, Malakoff, 16-Tackles, 1-FR, W/Gladewater 35-7. James Sylvester, DE, Newton, 8-Tackles, 3-TFL, 1-Interception for TD, 1-FR, W/Troup 69-14. Tyshawn Taylor, Longview, 11-Tackles, 1-TFL, 1-Sack, W/Vandegrift 56-28. Ja’Vontae Writt, Longview, 9-Tackles, 1-FR, W/Vandegrift 56-28. J.K. Martin, K, Longview, 8-8 XP’s, 1-punt for 40.0, W/Austin Vandegrift 56-28. Trevanta Royal, Daingerfield, 3-PR for 47.3-average, W/Corrigan-Camden 62-0. Frankie Sanchez, K/P, John Tyler, 1-Special Teams Tackle, 4-4 XP’s, 1-FG (45), 4-punts for 42.0-average, 6-Touchbacks, W/Frisco Lone Star 31-13. Dillon Williams, K, Pleasant Grove, 8-8 XP’s, W/Gilmer 56-28. Braden Brashear, QB, Cameron Yoe, 12-20 passing for 226-yards, 1-TD, 8-carries for 28-yards, L/East Chambers 35-34 (OT). Cameron Griffin, QB, Glen Rose, 21-39 passing for 416-yards, 4-TD’s, W/Lubbock Estacado 39-33. James Fullbright, RB, Midway, 14-carries for 54-yards, 2-TD’s, 6-catches for 53-yards, W/Klein Oak 28-27. Tyrek Horne, RB, Mart, 20-carries for 254-yards, 3-TD’s, 4-catches for 86-yards, 1-TD, W/Grapeland 64-22. Nick Jimenez, QB, Midway, 20-30 passing for 244-yards, 1-TD, W/Klein Oak 28-27. John Richards, RB, La Vega, 158-yards rushing, 1-TD, W/Paris 38-20. Taron Smith, QB, Milford, 13-20 passing for 166-yards, 4-TD’s, 9-carries for 103-yards, 2-TD’s, W/Union Hill 51-38. Alex Alonso, Cameron Yoe, 15-Tackles, 1-FR, L/East Chambers 35-34 (OT). Ty’Rike Brooks, LB, Midway, 12-Tackles, 1-TFL, 3-QBP, W/Klein Oak 28-27. Carson Byrd, DE, Midway, 9-Tackles, 2-QBP, 2-TFL, 1-PBU, W/Klein Oak 28-27. Roddrell Freeman, DE, Mart, 10-Tackles, 7-TFL, 2-Sacks, 3-QBP, W/Grapeland 64-22. DeMarquese Hayes, LB, La Vega, 13-Tackles, 3-Sacks, 1-CF, 1-FR, W/Paris 38-20. Marcus Johnson, LB, Midway, 16-Tackles, 1-Interception, 2-TFL, W/Klein Oak 28-27. Lance Jones, LB, Midway, 10-Tackles, 1-PBU, 1-CF, 1-TFL, W/Klein Oak 28-27. Preston Lane, LB, Mart, 14-Tackles (9-Solo), 3-TFL, 1-PBU, W/Grapeland 64-22. Antonio Arellano, Grandview, 38-yard Interception for TD, W/Franklin 24-21. Parker Nall, S, Midway, 6-Tackles, 1-FR for TD (35), 1-PBU that led to game-sealing Interception, W/Klein Oak 28-27. Taron Smith, DB, Milford, 2-Interceptions, 5-Tackles, W/Union Hill 51-38. Damyan Woodward, DB, Milford, 4-Interceptions, 4-Tackles, W/Union Hill 51-38. Ian Chavez, K, La Vega, 1-FG (28), 5-5 XP’s, W/Paris 38-20. Landon Seale, K, Grandview, 3-3 XP’s, 1-FG (28), W/Franklin 24-21. Kevin Yeager, K, De Leon, 6-7 XP’s, 1-FG (36), W/Riesel 44-21. Greg Martinez, Lorena, 25-yard Blocked Punt Return for TD, L/Pittsburg 34-28.